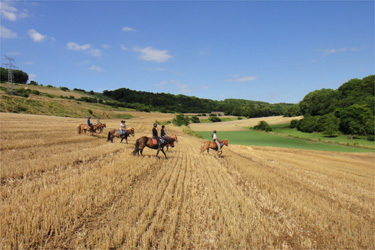 Starting at the Andelle valley, through the Lyons forest and the boutonnière brayonne, this journey of around 200km will combine the enjoyment of horseriding, nature, gastronomy, heritage and culture. Here, conviviality is a keyword. 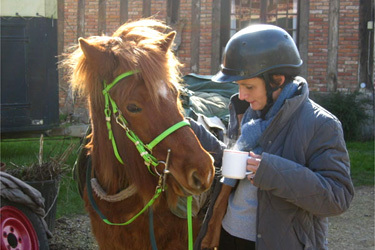 Life with horses, the careful food which will be offer you and good ambience will enable you to recharge your batteries in a charming surrounding. Meeting point at the equestrian center at 7pm where our guide is waiting for us. Now, it’s time to enjoy a good meal cooked by our guide. First meeting with the other riders and presentation of the trail programme of the week. Night in the holiday cottage. After breakfast, we leave to start the firt step of this trek. We go to the Crevon and l'Héronchelle valleys for a back on track step, it is time to discover and get to know your fellow traveller. 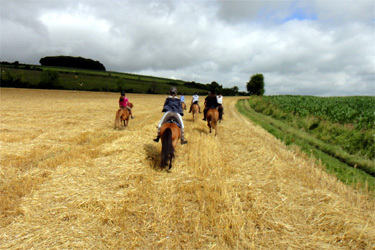 We ride in the middle of rolling landscapes with diverse colors, the green of forests contrasting with the pastures and fields' one. 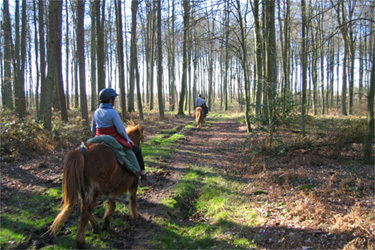 The big forest path will enable to enjoy some gaits. We take a break at the Garden of Sculptures of Bois-Guilbert, here we visit the garden and we meet the sculptor of this little paradise. Dinner and night at the holiday cottage. Today, we set off for the Pays de Bray crossing, where we will have the chance to admire the Abbey de Sigy en Bray, an old Benedictine abbey of the XIth century. Then we pass at the feudal clod of La Fert St Samson, which enable us understand the ingenious defense system that was deployed at the middle ages in the region. Then we finally arrive to the Bray farm, our step of tonight. After breakfast, we set out for a trekking day through hills an valleys. We are at the deapest point of Pays de Bray, where farming areas are the most remote and, for some, not plowed yet. We will be witnesses of vestiges of an ancient florishing indutry in the region : the clay. At the end of the day we arrive to our evening step at Buicourt. Dinner and night at Buicourt. 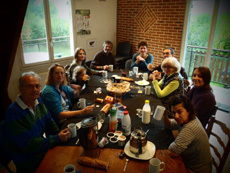 This morning, we leave the cottage to continue our trek in the Pays de Bray. We visit the Gerberoy village, considered by the most as "one of the most beautiful villages of France", wandering its cobbled streets. Then we continue the trek to go to the abbey of St Germer, an old benedictine abbey founded in the VIIth century by saint Germer, its first abbot. it was destroyed a first time by vikings at the meaddle of the IXth century and a second time at the beginning of the Xth century by Rollon, before being reconstructed at the XIIth century. We get to our refuge for the night, a bucolic step surrounded by nature. Dinner and night. For this second to last day of riding, we go to the Ste Hélène coast. Remarkable relief element, it offers from it summit an amazing panorama on the Epte and the Pays de Bray, which we have cross earlier in the trek. Archeological and historical site which is home to numerous popular traditions, it is also home to remarkable ecosystems overflowed with rare flora and fauna. 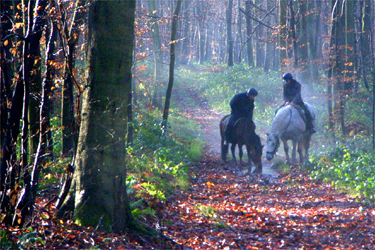 Then, we start the crossing of the famous land forest of Lyons, considered as the biggest beech forest of normandy and also the most beautiful of Europe. We arrive after a beautiful ride to the last step of the trek : Lorleau. Dinner and night in a holiday cottage. Last day of riding ! 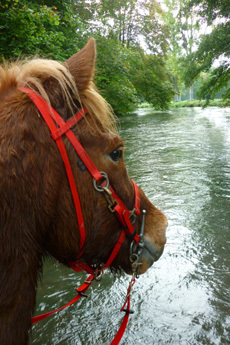 We continue our crossing of the forest of Lyons to get to the equestrian farm. 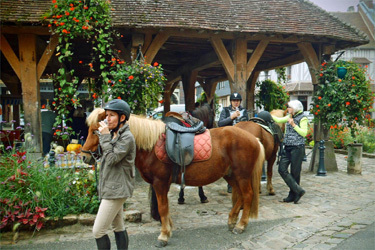 We ride through the little village of Lyons-la-Forêt. This village is practically squeeze in the heart of the land forest, which gave it its name. We continue our trek and for this last day our guide have a taste surprise in store for us which will make us travel beyond oceans. After this last meal together we set out for some more hours before getting to the farm. We pass in front of vestiges of Mortemer abbey which was affiliate to the Cistercian order. It was the first one in normandy before being pillaged by revolutionaries in 1789. Then we arrive to the farm, where, after take care of him a last time, we say goodbye to our fellow traveller. Tidying of the equipment before a last aperitif to share our memories of this beautiful trek. Individual departures of riders or transfer to the train station of Rouen. Important: The above itinerary is provided on an indicative basis and our guide reserves the right to modify the itinerary according to the condition of paths and the seasons. 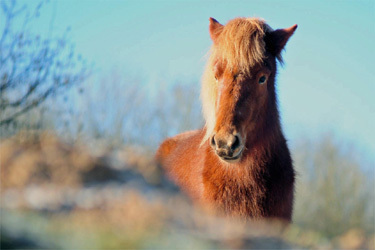 We prefer the Icelandic horse for its adaptation quality. 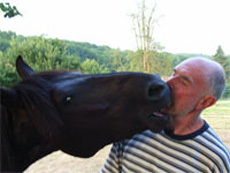 In fact, this is a strong, generous and kind horse which reassures its rider and easily crosses any path. 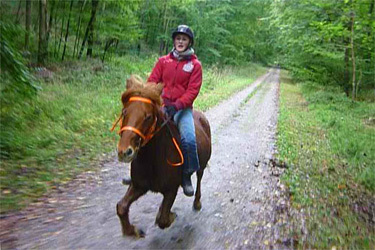 It is used to live in herd, so it is an excellent trail riding horse. 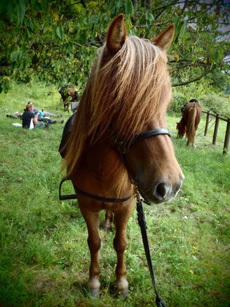 We use Icelandic saddles, barely different from the traditional English saddles. 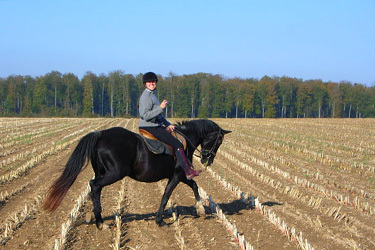 Their construction is similar to dressage saddles with a relatively flat sitting. The clamps are put on a long size. 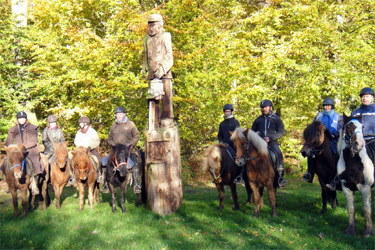 The "Lyons Forest" program is accessible for riders who are comfortable at the three gaits. 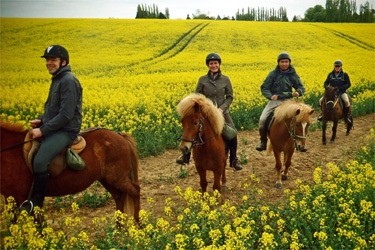 It can be your first time outdoor riding. Every rider is responsible for his horse: the horse’s foot, detection of small injuries, grooming, and is responsible for the equipment to maintain clean and in a good condition. Children from 10 years old accompanied by an adult are accepted if they have a suficient level. Children from 15 years old are accepted and don’t need to be accompanied. Patrice will be our guide, as well as, other qualified and experimented guides. They have ATE or BPJEPS degree, and hold the sports instructor’s registration. They are also full lovers of horses and nature. Picnics are prepared at the morning with local and often organic products. Then, we carry them riding. The luggage transport is done by the logistical vehicule. 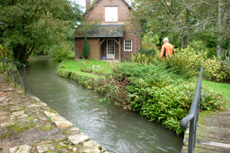 The accomodations are holiday cottages, in 2 to 4 persons bedrooms. No possibility of individual bedroom. The midday picnic is individually prepared in the morning using a vegetables, fruits, cooked meats, and local cheese buffet, and taken by each rider in his saddlebags. Diner is a convivial moment. Cooking is made on site, using products found by the intendant each day. Languages spoken by the guide: English / French speaking guide. Please, plan to arrive at around 8pm the first day, and to leave after 6pm the last day. A week to get your fill of fresh air at some hours of Paris ! 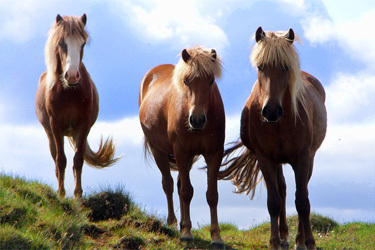 a unique experience with Icelandic horses.
" In the description of the itinerary it was in question of a surprise the last day, but in reality each day was a wonderful surprise. Week and short rides in Alsace. 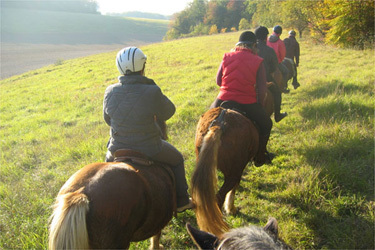 Horseback ride in the Vienne Valley.